All of August: Annuals may appear leggy and worn now. These can be cut back hard and fertilized to produce a new flush of bloom. Soak shrubs periodically during dry spells with enough water to moisten the soil to a depth of 8-10 inches. August 1 - 15: Madonna lilies, bleeding heart (Dicentra) and bloodroot (Sanguinaria) can be divided and replanted. August 1 - 15: Sow seeds of beans, beets, spinach and turnips now for the fall garden. Spinach may germinate better if seeds are refrigerated for one week before planting. August 15 - 31: Fall-bearing red raspberries are ripening now. Begin planting lettuce and radishes for fall now. 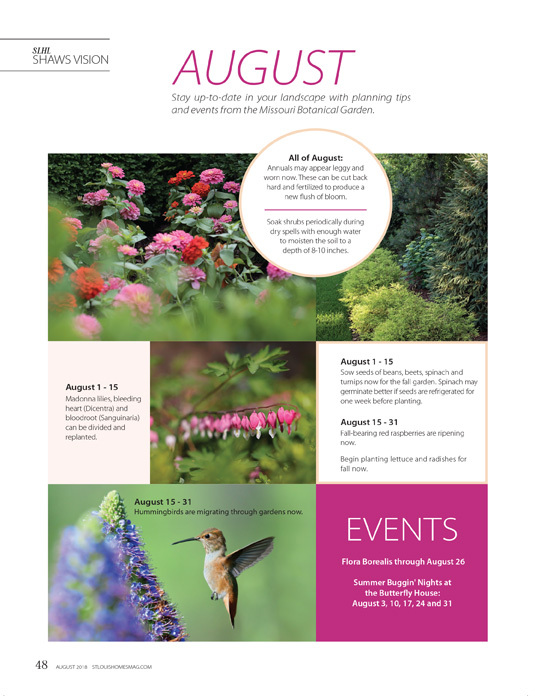 August 15 - 31: Hummingbirds are migrating through gardens now.